The lace was ordered through an online company, Cheap Trims, and I dyed the black portions by hand. The fabric was purchased locally. 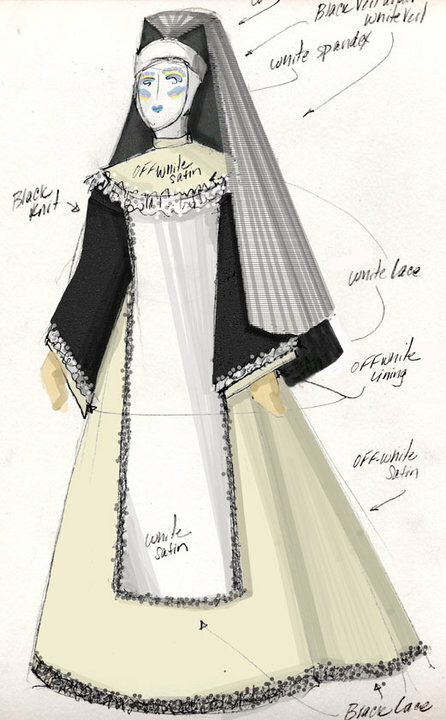 The dress itself was patterned off of another dress that didn't have sleeves--I added the stretch velvet black with the white under sleeve. It has an invisible zipper up the back, and is worn with a cotton petticoat underneath the whole thing... The coronet is half-inch foam that's held onto the head with a drawstring inserted in the circumference. The scapular and bib were fashioned off of pictures of authentic habits, and the coif is made of spandex (like a clown's). 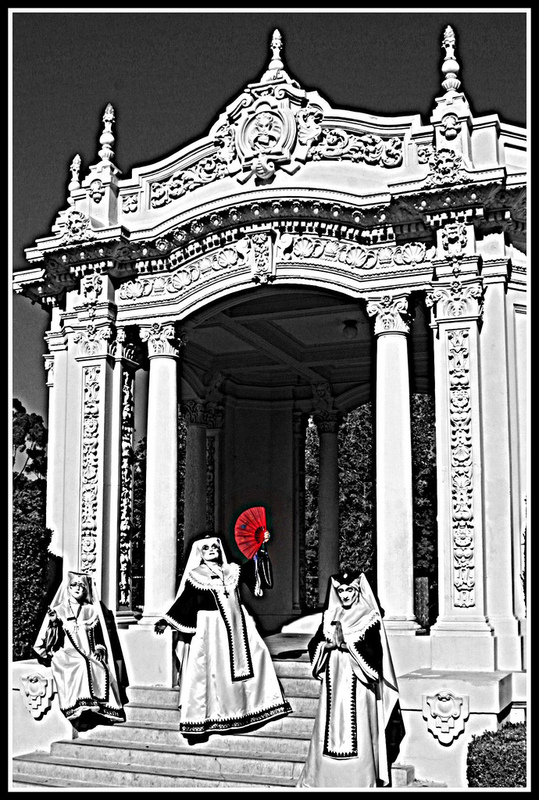 The photography was done by one of the Saints of the local House, Sarah Biggart (aka St. Shudda Bug) in beautiful Balboa Park at the Spreckels Organ Pavillion. More of Sarah's work can be found here. 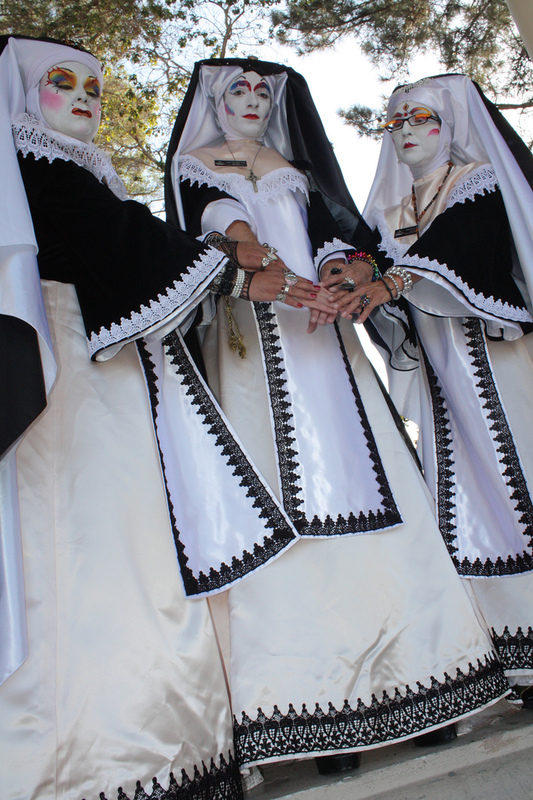 It may seem somewhat odd, making nun habits for a bunch of men. But for many years I, too, used to get dressed up and do "missionary work" in the community. 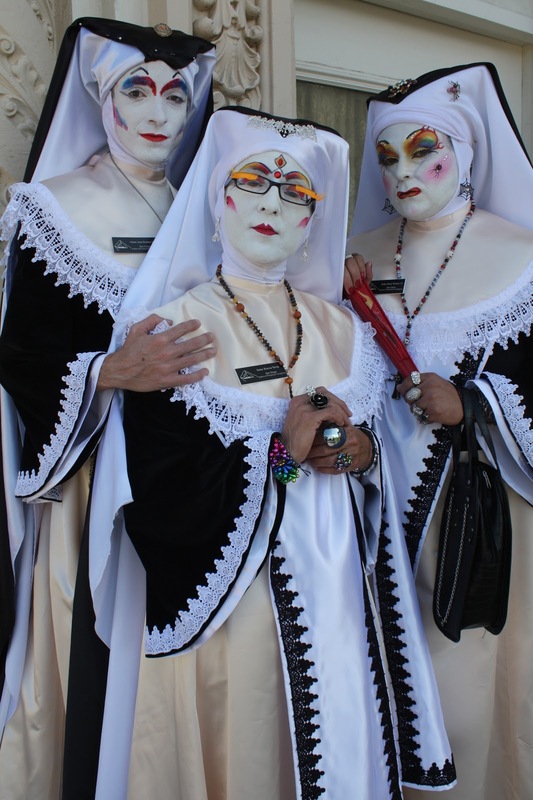 The Sisters are a controversial organization, and have drawn a lot of ire for doing what they do... On the surface it may appear they are making fun of religion by dressing up as a mockery. But it couldn't be further from the truth. 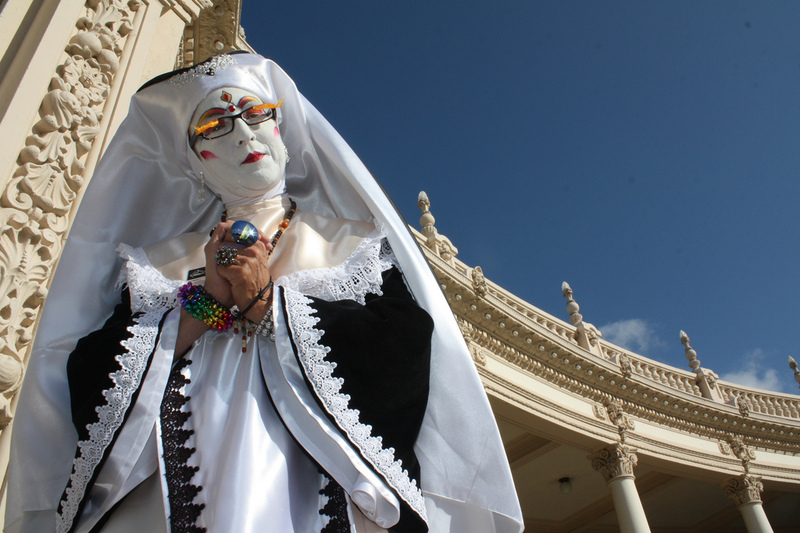 These men (and women) take their own set of vows to serve their community just like nuns from traditional faiths and they raise money for charitable causes, help the sick, volunteer, and spread the word in favor of causes they believe improve quality of life. They work mostly in gay communities. There are over 50 "Houses" all over the world in multiple countries including the US, Australia, the UK, France, Germany, Uruguay, Columbia, and Switzerland. Together they have raised millions of dollars as well as awareness of various causes for their local areas. The US has Houses in over 20 cities with more developing every day. A lot of people are terribly offended by their appearance, feeling as if they are making fun of people's beliefs. They aren't. It takes a bit of explaining. And when it comes to matters of faith, religion, and values, the conversation tends to get pretty abstract. On the simplest level it can be perceived as "performance art", and the nature of their work calls for a lot of "costume and makeup". And that's where I fit in. I make wearable art and costumes, and these pieces took a lot of time to construct. I'm quite proud of them! They weren't cheap--the materials are one thing, but the time required to build them adds up into many many labor hours... Whew! The original design was rendered in pencil, then transfered to my computer into Photoshop. I did the coloring and shading in that program. I'm starting to really like working in Photoshop--it can do so much without doing it "permanently"... I can envision a desired effect, try it out, and then erase it if it's not working the way I want it to. In the end, however, a drawing is simply a drawing--it's the translation into reality that's the hard part! Alright, until next time, Live Life with Relish! I can see Sally Field in these sans the face goo. All they need is a big gust of wind. LOL! These are absolutely immaculate! I love them.